Blend with 1 scoop of shaved ice and pour into a Scorpion bowl. Add ice cubes and decorate with a gardenia. 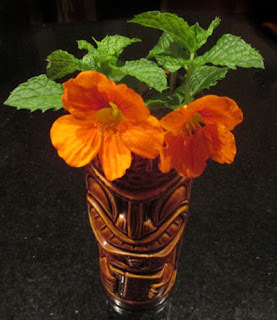 Here I shook with crushed ice, poured into a Tiki mug, and garnished with mint and naturtiums. Two Mondays ago for a nightcap, I reached for Trader Vic's 1974 Rum Cookery & Drinkery. There, I spotted the simple but refreshing looking Outrigger Tiara. Once in the Tiki mug, it offered peppery, floral, and minty aromas. Next, the sip was tart and citrussy with lemon and orange flavors and perhaps a berry note from the pomegranate, and the swallow was all about the funky rum medley.